After a B.A. degree: What about Graduate Studies? The graduation checklist is also available in PDF format. Check out the Planning Your Arts Graduation video for an audiovisual overview of planning your graduation. NOTE: Students who are taking one or more courses at another university during their term of graduation WILL NOT be eligible to graduate at the end of that final term. These students MUST select the NEXT available term of graduation. Step 1 - Apply for graduation on Minerva (U3 students only). Select your expected final semester of study. Note: If you are taking courses at another University in your final semester, you will need to select the following semester for graduation (Ex: If your final term is Winter 2019 and you are taking courses at another University, your expected term of graduation term is Summer 2019). ( See Transferring Credit "U3 students & Graduation"). If your Minerva record indicates that you are in your U3 year of study and you are blocked from selecting or changing your graduation term on Minerva, you must contact Service Point. Missed the deadline to apply for graduation? Complete the form here. NOTE: Faculty advisors cannot confirm your program requirements! Ensure that you have declared the correct programs on Minerva to avoid having your record reviewed for the wrong program. If necessary, correct your program selection on Minerva. If you are blocked from making program changes on Minerva, contact Service Point immediately. Contact your departmental advisor(s) to confirm that you have completed your program requirements. A course can only count towards one program of study (Exception: with the approval of your departmental advisor, a freshman course can count towards both your U0 requirements and your program requirements.). All required and complementary courses used to fulfil program requirements must be completed with a grade of C or better. Students completing the requirements of an Honours or Joint Honours program may need to achieve a higher minimum grade. Courses in which you have received a final grade of D can count for elective credit only. If you repeat a course you have previously completed with a final grade of D, you will not earn an additional three credits when repeating the course. Do not use the Degree Evaluation Tool on Minerva to confirm your programs requirements. You must confirm that you have completed your program requirements with your departmental program advisors. Ensure that at least 2/3 of each of your program requirements is completed at McGill University. View the Residency Requirement policy for more details. Step 5 - Be aware of codes in the “Remarks” column of your unofficial McGill transcript. 3) two courses on your transcript that have the same course number. For example, if you complete HIST 315 (Topics course) in Fall 2014 and complete HIST 315 (Topics course) in Fall 2014, you will not receive credit for both courses. If the topic of the courses is different, you must advise the department offering the course to enter an “I” flag on both courses so that credit will be granted for both. 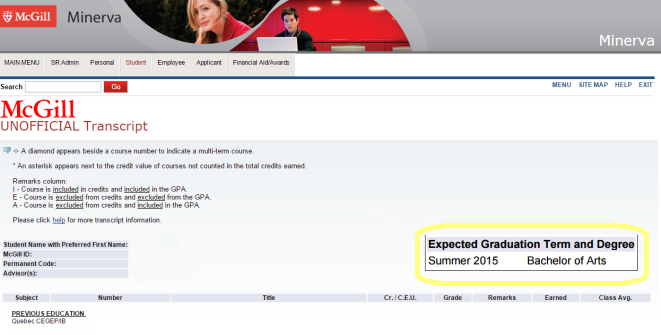 Step 6 - Verify your CGPA and overall credits. Note: any unresolved grades of L (deferred exam), K or KE (an extension to submit work) will postpone your graduation. The minimum CGPA required to graduate is 2.0. Step 7 - Verify that all Transfer Credits and Advanced Standing credits appear on your record (study away/exchange & pre-McGill credits). Step 8 - Verify that you have not exceeded the maximum amount of out-of-Faculty credits permitted for your B.A.as explained here. If you are pursuing an out-of-Faculty program, you may take up to a total of 30 credits (consisting of both required and elective credits combined) outside of the Faculties of Arts and Science during your entire B.A. degree. Other: Tuition Fees, Library Fees, Permanent Code, etc. Where can I see the status of my graduation record? IMPORTANT: If you check your Minerva graduation record before the dates listed above, you may receive a message stating your record is not active! Your Departmental Program Advisors will first review your record followed by a Faculty Advisor. Once departmental and faculty graduation requirements have been met, the graduation module on Minerva will indicate "Approved". You will be contacted via your McGill email account during the review period, should any problems arise. Please check your McGill email regularly during this period to avoid a delay in the review of your graduation record.